Yahoo, ABC, HuffPo, ESPN: How Do You Run a News Portal? First thing Monday morning Yahoo and ABC News announced a new distribution deal — familiar stuff, albeit between two big partners. It will encompass gems from the TV network’s global news and politics coverage, involve the broadcast anchors and star correspondents, include original online content, inspire the occasional collaboration, all served up directly to Yahoo’s massive audience on desktops and mobile devices everywhere. 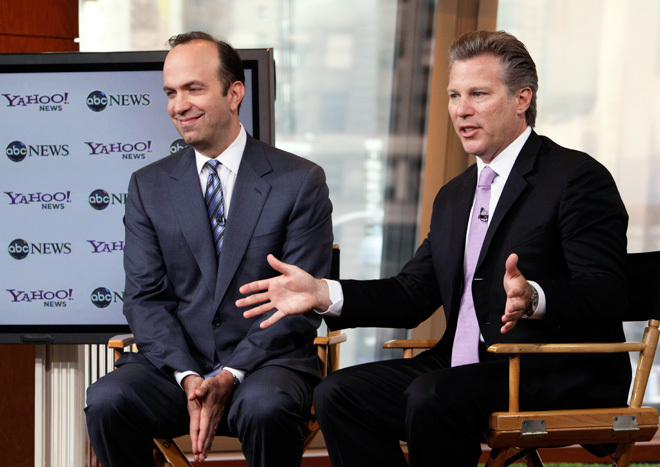 At a press conference Yahoo’s Ross Levinsohn and ABC News’ Ben Sherwood touted the huge online readership of Yahoo.com, repeatedly mentioning the portal’s 25 million daily and 100 million monthly visitors. “That reach can’t be replicated in any other medium,” Levinsohn said. But a funny thing happened just before the Yahoo/ABC press conference: AOL’s The Huffington Post released its monthly traffic numbers, showing 37 million unique visitors in September and over one billion page views. That’s still less than half of Yahoo’s 100 million monthly users. But remember: nobody goes to HuffPo to check e-mail or search the web. All those hits are news related. The Huffington Post also announced it was launching four new sites: Huff/Post50 (a site for boomers), HuffPost Gay Voices, HuffPost Weddings, and HuffPost High School, making a staggering 21 new verticals since HuffPo and AOL merged in March. On top of that, HuffPo snapped up Localocracy, a Massachusetts-based civic engagement and local politics platform. Localocracy’s founders are joining up with HuffPo’s broader Media Group to take that community magic national. HuffPo also wooed away the New York Times‘ Lisa Belkin, who will have a blog/column covering parenting, work/life balance and family. Like Yahoo News, HuffPo is trying to win web users with a mix of high-value and community-created content. With Yahoo’s ABC partnership and HuffPo’s existing readership, both sites are also targeting the same content categories (political coverage and lifestyle news) and demographic group: a mainstream audience that skews older, female and middle-class. HuffPo’s new verticals double down on this core readership even as they ever-so-slightly extend it. Call it the Expanded Facebook demographic.